Tribes: Ascend developer Hi-Rez Studios has put the Xbox 360 version of the game on indefinite hold so it can focus solely on the PC release. Tribes: Ascend has previously been billed as a free-to-play online shooter for the PC and Xbox 360 that will hit the digital market later this year. But Hi-Rez has now confirmed with GameSpot that while the PC release of the game remains on track, the Xbox 360 version has been "back-burnered." It's not an outright cancellation but for now the studio is working exclusively on the PC release. "An eventual XBLA version - and even PSN version - is not out of the question but neither will be this year," a Hi-Rez representative said. The rep didn't specify the reasons for the shift but according to Edge the thanks goes to Microsoft, which isn't down with the idea of allowing microtransactions on Xbox Live. Like nearly all free-to-play games on the market, Tribes: Ascend will rely on microtransactions to generate revenue, allowing gamers to buy things like weapon loadouts and unique skins while they play the game. It was reported in April that free-to-play games could come to Xbox Live sometime in 2012, but that's not soon enough to do the initial release of the new Tribes game any good. 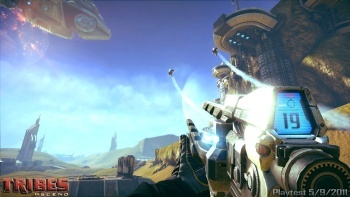 Tribes: Ascend is slated to come out later this year, exclusively [for the moment, at least] for the PC.